(Phys.org) -- The worlds smallest three-dimensional optical cavities with the potential to generate the worlds most intense nanolaser beams have been created by a scientific team led by researchers with the DOEs Lawrence Berkeley National Laboratory (Berkeley Lab) and the University of California (UC) Berkeley. In addition to nanolasers, these unique optical cavities with their extraordinary electromagnetic properties should be applicable to a broad range of other technologies, including LEDs, optical sensing, nonlinear optics, quantum optics and photonic integrated circuits. By alternating super-thin multiple layers of silver and germanium, the researchers fabricated an indefinite metamaterial from which they created their 3D optical cavities. In natural materials, light behaves the same no matter what direction it propagates. In indefinite metamaterials, light can actually be bent backwards in some directions, a property known as negative refraction. The use of this indefinite metamaterial enabled the scaling down of the 3D optical cavities to extremely deep subwavelength (nanometer) size, resulting in a hyperboloid iso-frequency contour of light wave vectors (a measure of magnitude and direction) that supported the highest optical refractive indices ever reported. This study was directed by Xiang Zhang, a principal investigator with Berkeley Labs Materials Sciences Division and director of UC Berkeleys Nano-scale Science and Engineering Center (SINAM). He is the corresponding author of a paper describing this research titled Experimental realization of three-dimensional indefinite cavities at the nanoscale with an anomalous scaling law, which has been published in the journal Nature Photonics. Co-authoring this paper with Zhang were Xiaodong Yang, Jie Yao, Junsuk Rho and Xiaobo Yin. Optical cavities are the major components of most lasers. Light confined within an optical cavity will be reflected back and forth between two opposing mirrors to produce a standing wave at a specific resonant frequency. It is from this standing light wave that a laser beam is generated. Optical cavities made from natural materials can be no smaller than the wavelength of the light propagating through them. 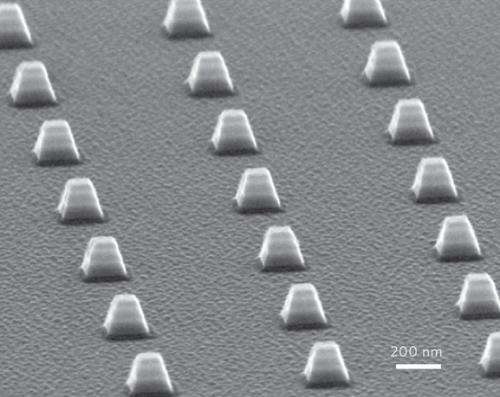 Metamaterials, however, allow for electromagnetic behavior that is not attainable in nature. 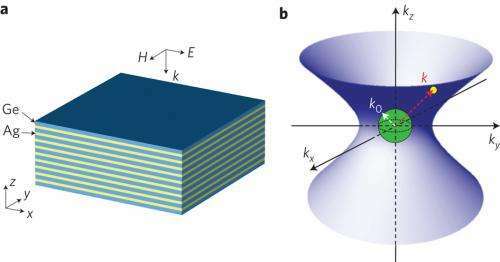 Engineered from a combination of metals and dielectrics  insulators that become polarized in the presence of an electromagnetic field  metamaterials derive their optical properties from their structure rather than their chemical composition, as is the case with natural optical materials. Another advantage of using indefinite metamaterials to make their 3D optical cavities, Yang says, is that cavities with different sizes can have the same resonance frequency, providing more flexibility in the optical cavity design. 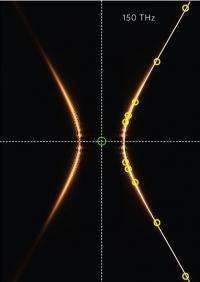 Another advantage is that the photons lost when light is reflected back and forth  a problem for optical cavities from natural materials  is reduced as the cavity size gets smaller. Yang says this will benefit the design of future nanoscale lasers. Germanium was the dielectric chosen to make this metamaterial because it has a relatively high refractive index (about 4.0), compared to air (1.0), which is the dielectric most typically used to make a metamaterial. The alternating layers of silver (20 nanometers thick) and germanium (30 nanometers thick) were cut into cubes of various sizes, depending on the number of metal/dielectric layers. The cube walls tilt into the shape of a trapezoid during the final stage of fabrication with a nano-sized optical cavity in the core. This research was supported by the U.S. Department of Air Force Office of Scientific Research. Could light and matter coupling lead to quantum computation?